Today we take a short early morning flight from Kathmandu to Lukla (2,800m) and begin the Everest basec camp trek to Phakding (2,652m). Descending out of Lukla the trail we trek, gently winds its way along the river and serves as an easy introduction to the more challenging trekking days we face ahead. We overnight at Phakding at one of the many comfortable trekking lodges. Today's hiking starts gently as we make our way along the river to the entrance of Sagamartha National Park; this is where we will obtain our trekking permits and register with the park authorities. Soon the trail starts to rise and we begin the long climb up to Namche Bazaar (3,446m), where we stop for the night. You have a free day in Namche Bazaar today, for acclimatisation. This colourful Sherpa town is a great place to spend time exploring and makes welcome break from trekking. There are plenty of shops and stalls selling everything form cut price trekking gear to Buddhist prayer flags. Its internet cafes, bakeries and cafes are also popular with the many visitors. Of course, if you’re not too tired, there are plenty of interesting and scenic day walks you can do if wish. We overnight at a lodge in Namche Bazaar. We spend today in Dingboche acclimatising to the high altitude. This traditional Sherpa village is a patchwork of fields enclosed by stonewalls and offers wonderful views of the surrounding mountains. If you've got plenty of energy and don’t feel like resting you can trek up the valley towards Chukung for even better views. We overnight at a lodge in Dingboche. Today we climb up from Dingboche and follow the valley high up on one side until we reach Dughla (4,620m) and the entrance to the Khumbu valley. 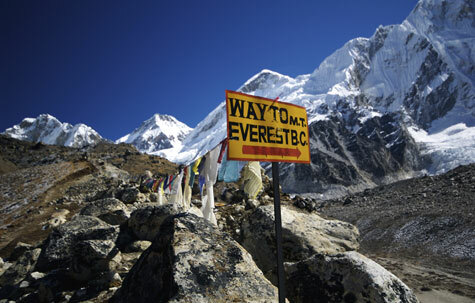 Heading up the Khumbu valley, a steep climb takes us over the Thokla Pass (4,830m). From here we hike along the edge of the glacial moraine onto Lobuche (4,910m). We overnight at a lodge in Lobuche. This morning we catch the flight from Lukla back to Kathmandu, where we transfer you to your city centre hotel. The rest of the day is free. You can also arrange some tours with your local guide today for your free day tomorrow..
Today is kept as a free day, leaving you to enjoy Kathmandu at your leisure. There are many options available including visits to the nearby towns of Patan and Bhaktapur as well as the chance to go rafting on the Bhote Khosi River.Note. This day is built into the itinerary in case of delays to the flight back from Lukla to Kathmandu, which do occur fairly frequently when the weather is cloudy or there are high winds.